Harbor East Marina in Baltimore hosted a grand re-opening in June, after major renovations to bring the marina up to date. The facility was decades old and primed to be a central waterfront feature of a vibrant downtown area, which had seen a lot of revitalization in recent years. 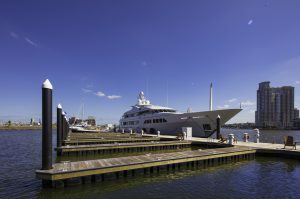 The trendy area of Baltimore Harbor had seen a lot of investment in business and high-end architecture, and the marina needed a grand new vision to match its surroundings. The two phase project replaced all the docks and equipment, while the marina remained open for business. 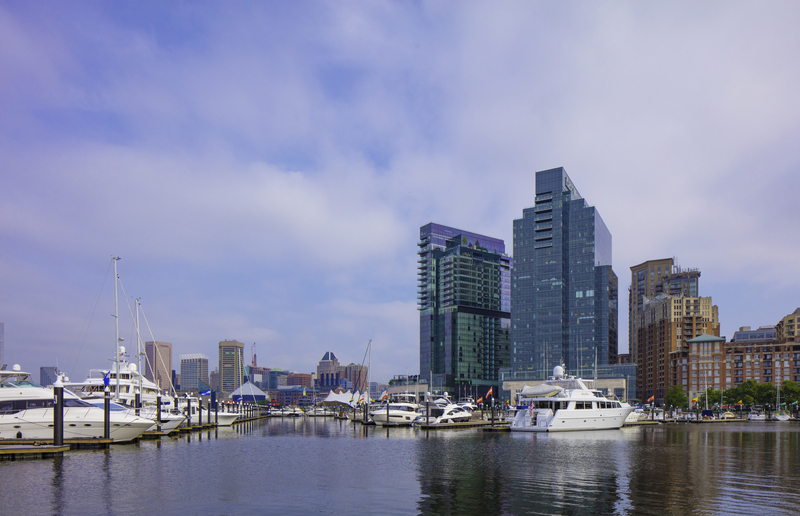 The marina, a Baltimore City property, is leased to Harbor East Development, which operates a larger mixed-use development at the waterfront, including shopping, dining, hotels and residences. Harbor East hired Oasis Marinas to operate the marina. The management firm operates 14 facilities, in Maryland, D.C., Virginia and New York. Oasis Marinas worked with the ownership on the design of the marina and worked on-site with general contractors Dissen & Juhn and many subcontractors during the renovation process. The more than $8 million project received some federal and state funding awards — $1.6 million from the federal Boating Infrastructure Grant Program (BIG) through the U.S. Fish & Wildlife Service, and $900,000 from the Maryland State Waterway Improvement Fund (WIF). The contract for the project was awarded in the fall of 2016, to replace the 175-slip marina with new modern docks. The project was broken into two phases to accommodate the summer boating months and keep the marina open throughout the project. The construction also included a dredging project, performed by Dissen & Juhn, at the northwest corner of the marina. Sediment from Baltimore Harbor had been accumulating in the area for some years. Sediment disposal presented a challenge for the project, as did logistics for equipment and materials. With no construction access to the facility by land, all equipment and materials had to be barged in. Also, the dredging project was ongoing during some of the work, putting four crews at work simultaneously – a dock assembly crew putting together the main docks; a pile driving crew; subcontractors installing utilities; and the dredging crew – which all needed supplies and equipment with little access on-site. The job site also had limited storage. Originally, the owner provided a commercial bulkhead and material storage area downstream of the marina, but after construction started, the owners curtailed use of this area for the project. Material could only be stored in small quantities and use of the site was restricted to lessen noise during peak business hours. Also, no demolished docks, piles or dredged material could be unloaded at this site. The new marina has 184 slips, from 30 to 100 feet, with side-tie dockage for superyachts. Alternately, Dissen & Juhn located other unloading sites within the greater Baltimore area and farther south. For the dredging project with no convenient bulkhead on which to unload dredged material, this did require a major change in dredging methodology for Dissen & Juhn. Instead, the sand and silt went directly onto a 2,500-cubic-yard mud scow, which towed the material 3.5 miles to a state-owned dredge material placement (DMP) site, where it was unloaded hydraulically and the pumped into large dike basins. Dissen & Juhn dredged about 12,000 cubic yards with mechanical dredges. The demolition and disposal phase was logistically challenging because of transportation and access issues, but also because the process is inherently messy. The existing docks were broken in large pieces in the water, loaded onto barges and towed to a commercial bulkhead farther down the Chesapeake Bay. All the docks, piles, utilities and equipment for installation also had to come by barge. Material storage at the job site was limited, so equipment scheduling and coordination was crucial and detailed. Truck deliveries and barge availability had to be tightly coordinated to deliver 40-foot dock sections and piles, plus wire, conduit, electrical systems and water piping for utilities. The dock assembly crew floated several 40-foot length sections of the main dock together and secured them with temporary moorings. Then, the pile driving crew fine-tuned piling placement and permanently securing the docks. Finally, subcontractors installed utilities. The main docks were installed, followed by the finger piers. All material for each step was barged to the site just as it was needed. Dissen & Juhn performed 80 percent of the on-site construction. The docks were built by Meeco Sullivan. 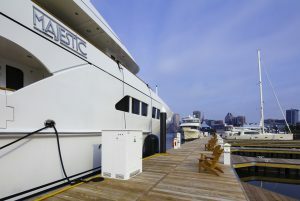 Marina Electrical Equipment (MEE) manufactured the pedestals and accessories, which were installed by Cahill Electric. Moffatt and Nichol did the design and engineering work for the project. Meeco Sullivan said the docks were designed with many unique and custom features to give the design an elevated look and functionality. The Sullivan Timber System was upgraded to be more robust, including 18-inch piles. The owner chose Ipe decking, a Brazilian hardwood with rich color and durability, and all the decking was recessed to provide cleaner edges. The docks are all full-length, single loaded slips, and the fingers were designed with angled corners to complement the recessed decking. The breakwater and side-tie dock are two pieces (685 feet and 268 feet of docks), and the 16-foot wide span is formed with two 8-foot sections bolted together. Meeco Sullivan was awarded the contract in January 2017. The phase one docks were delivered in April 1017 and phase two docks arrived in early 2018. Installation was completed in May 2018. The docks also include floating party pads, places for social gathering throughout the marina. The main 50- by 60-foot party pad is covered with electricity, tables and seating for large groups. These structures are permanent and attached to the docks. The marina uses the party pads to host private parties and weddings and other slipholder events. Each slip has 30- to 100-amp electric service at the pedestals. The pedestals have standard meters for water and electric, which must be read manually, and a 30 milliamps (ma) ground fault protection circuit breaker at each receptacle. Chris Dolan of MEE said the protection could also be placed at the distribution panels that provide power to each pedestal, but if a boat causes an outage, facilities cannot quickly identify what vessel is causing the issue. It’s a more expensive option, but with protection at each pedestal, Harbor East can easily identify boats that are causing stray current issues. 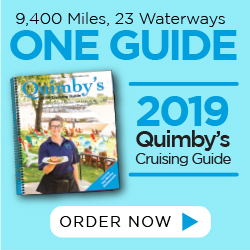 The marina customers are about 60 percent transient boaters and the rest annual customers, with a good mix of power and sail, said Eric Bradley, vice president of operations at Oasis Marinas. “We were leaders in the electrical layout, as we tried to market more toward superyachts,” Bradley said. The management company pushed for equipment that would accommodate large yachts, knowing it had demand it couldn’t meet. The marina operates with 14 employees during season, headed by General Manager Andy Lancos.